(Nanowerk News) Pretty soon, powering your tablet could be as simple as wrapping it in cling wrap. 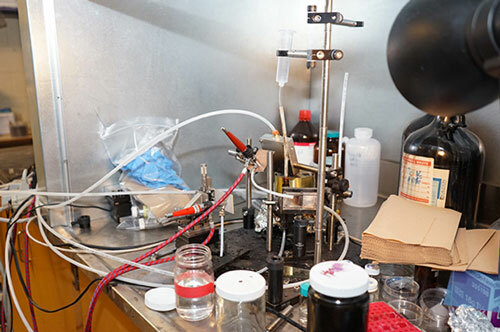 Until now, it was only possible to incorporate light-sensitive CQDs onto surfaces through batch processing—an inefficient, slow and expensive assembly-line approach to chemical coating. SprayLD blasts a liquid containing CQDs directly onto flexible surfaces, such as film or plastic, like printing a newspaper by applying ink onto a roll of paper. This roll-to-roll coating method makes incorporating solar cells into existing manufacturing processes much simpler. In two recent papers in the journals Advanced Materials ("Efficient Spray-Coated Colloidal Quantum Dot Solar Cells") and Applied Physics Letters ("Colloidal quantum dot solar cells on curved and flexible substrates"), Kramer showed that the sprayLD method can be used on flexible materials without any major loss in solar-cell efficiency. In a third paper in the journal ACS Nano ("Electronically Active Impurities in Colloidal Quantum Dot Solids"), Kramer and his colleagues used IBM’s BlueGeneQ supercomputer to model how and why the sprayed CQDs perform just as well as—and in some cases better than—their batch-processed counterparts. This work was supported by the IBM Canada Research and Development Centre, and by King Abdullah University of Science and Technology.